All of heaven is available to you right now through the finished work of the cross. But often it does not look or feel that way. The reason: There is a battle for your mind, will and emotions that largely determines the fullness of God’s presence, power and Kingdom that you walk in. It is critical that you partner with Him to win the battle. Winning the Battle for Your Mind, Will and Emotions is the secret to walking in the more of God you have been crying out for. The wisdom of God drips off the pages of this book. Chapter after chapter will impart to you solutions to many of your life battles. Secrets for success are unlocked, wisdom for your personal struggles is imparted and strength to make wise decisions is waiting to be given to you! 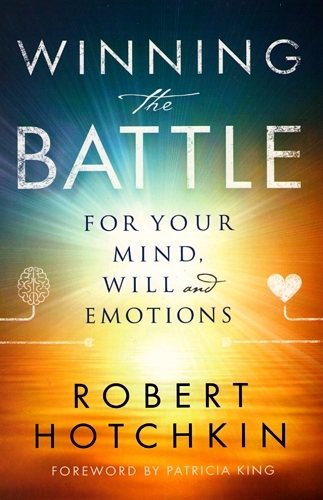 Winning the Battle for Your Mind, Will and Emotions will set you free to be the overcomer you are meant to be. Read this book to be a champion. Share this book with someone to be a blessing. Live the contents of this book to become a gate of heaven on earth. The apostle Paul spoke of taking every thought captive to the obedience of Christ. In other words, we have been granted the authority from God to control what would otherwise control us. 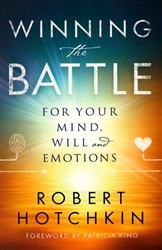 In Winning the Battle for Your Mind, Will and Emotions, Robert Hotchkin shows from Scripture and personal experience how to contend in this arena and come out victorious. Robert Hotchkin is a speaker, author, media host and one of the core leaders of Patricia King Ministries. His preaching, teaching and ministry inspire believers to grab hold of their restored relationship with the Father through the finished work of the cross and walk the earth as Jesus did – destroying every work of darkness everywhere they go. Robert and his wife live in Maricopa, Arizona.